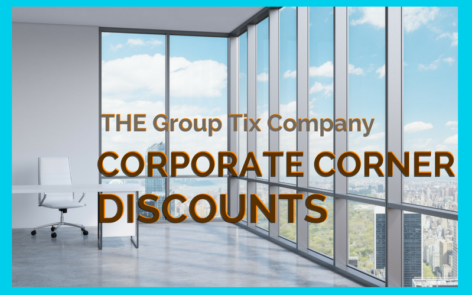 THE Group Tix Company is an independent agency offering ticket purchasers much more than convenience and cost-savings on tickets to theatre and events. Founding Director Martin H. Onrot and the group sales team apply their diverse and collective experience, knowledge and shared commitment to service in creating a client-friendly and patron-committed company. Building relationships is THE Group Tix Company’s top priority. We offer our clients the best discounts for Theatre and Events in Toronto and across Canada; and do so in a courteous, helpful and knowledgeable manner. Building relationships is our top priority. Group sizes will vary by show. All sales are final. No refunds, cancellations, credits or exchanges. THE Group Tix Company reserves the right to cancel any booking for which the balance is overdue. Reducing the group size to less than the minimum number will incur a service charge. Service charges apply to all shows and may vary per show. Please see specific show for further details. If your group falls below the minimum ticket requirement, a single ticket service charge will apply. Payment policies may vary. All group ticket purchases require a 20% non-refundable deposit to be paid within 2 weeks of booking date. For orders over 75 tickets, a total deposit of 40% is required at time of booking. Full payment due 8 weeks prior to show date or otherwise specified. Any order booked within 8 weeks of the performance date must be paid in full at time of booking. Please call the Group Sales Office for more information. Payments can be made by Visa, MasterCard, Company Cheque, Money Order, Bank Draft, Certified Cheque and Cash. Tickets will be delivered upon receipt of payment. A 10 day business hold is required for all cheque payments. All orders will be couriered to the client at their expense unless other arrangements are made. Call one of our Group Tix Company Sales Consultants and we will take you through the order process of picking seat locations, addressing any special requirements, reviewing the prices and payment terms. Organizing a group can easily get confusing or frustrating. We are here to help you make the process easier. Below are just a few examples of ways we can assist group leaders. Contact us for additional details and options. Groups may require a unique information marketing piece along with the discount information. We are happy to accommodate any additional requirements on promotional materials. For example, the organization’s logo can be inserted on the promotion pieces or we can create e-mails according to your specifications. Pick your Date and Reserve Your Seats. Most productions allow us to place large hold for groups, allowing you time to gather your group before payment is due. Excel seating charts can be created for your group order to easily facilitate seat assignments. Upon request we will research best price hotel and restaurants in the vicinity of the venue or theatre that you are attending. You will save on your service charges by purchasing in a group as well as receiving up to 2 complimentary tickets for the group leader (where applicable).